This article is about Ike's appearance in Super Smash Bros. Brawl. For other uses, see Ike. Ike (アイク, Ike) is a newcomer appearing in Super Smash Bros. Brawl. He was revealed in the Smash Bros. DOJO!! on August 1st, 2007. Ike is voiced by Michihiko Hagi in the Japanese version, and by Jason Adkins in the English version. Ike is currently ranked 23rd on the tier list in middle tier. Ike possesses extreme power throughout his moveset, with some of the strongest attacks in Brawl, and nearly every attack of his is capable of KOing under 150%. In addition to this, Ike possesses arguably the greatest average reach in Brawl, made better by nearly every attack having disjointed reach, and possessing many attacks with transcendent priority. Ike also has a recovery that protects him greatly, great endurance thanks to his heavy weight and great momentum cancelling abilities, and fearsome edge guarding capabilities. Ike's biggest boon however, is his amazing jab, that is fast, possesses great reach for a jab, deals high damage, and can jab cancel to create highly damaging combos and setups into KO moves (such as up tilt and back aerial). Ike suffers greatly though from his incredibly slow and laggy moves, with the speed of his attacks being on par with Ganondorf for the worst in Brawl. As a result, Ike is highly reliant on reads and spacing to land hits when his opponents are outside his jab range. Additionally, Ike's recovery gains short distance, and is very susceptible to gimping, with semi-spikes being especially deadly. Ike also lacks any projectile, which when combined with his large size and below average movement speed plus mobility, makes it difficult for him to break through camping, as well as being incapable of camping himself. This overall results in average matchups (with remarkably few counters for a mid tier character, plus an even matchup against three characters in the top/high tiers, though his especially terrible matchup against Meta Knight is problematic), and Ike has achieved above average tournament results. Ike is a moderately heavy character with very slow but powerful attacks. Most of his attacks possess high damage, high knockback, and good range, giving Ike excellent KO potential at low damages. Ike is also one of the best characters to crouch-cancel a jab with, as the move can accrue upwards of 20% on opponents when crouch-canceling the original hit into another jab a few times. Ike works best when playing the range game, best maximized by using his forward aerial whenever retreating. His forward aerial has the distinction of having the most horizontal attack range of any normal aerial in the game. Though Ike himself is slow, his attacks will surprise opponents when hitting from maximum range. Using the attack to effectively approach depending on the situation, Ike can pursue follow ups such as more forward aerials, his far-reaching dash attack, or an attempt at outwitting the foe into his Quick Draw side special. However, all three of those moves are very punishable if they miss. At a distance, one can even use Quick Draw to punish floor recoveries and floor attacks because of the move's ability to be held indefinitely. Should Ike have to deal with opponents close in, he can easily use his competent jab to either put the spacing back on or to transfer to a throw, with either the back or forward variants capable of putting the opponent in a vulnerable position should they be at the edge. Though more effective as a KO move, Ike's back aerial is amazingly fast and can catch opponents off-guard but has high ending lag, should the player be in a position to chase or attack in-close. If the close-in war is being waged at the edge, Ike can be an effective edge guarder, having his long-ranged forward aerial, his down tilt meteor smash, his Aether special, and his deadly down aerial meteor smash or back aerial as options to harass the opponent (as well as the aforementioned jab/throws). Ike is also one of the game's deadliest air-dodge/roll trappers, given his far-reaching forward smash and its tremendous power; it is a useful move so long as Ike is never predictable with it. Up-smash can be also be used in this fashion due to its similarly wide sweeping motion, and is preferable to Ike's down-smash for punishing excessive rolling and also giving him the ability to have a surprisingly long hyphen smash considering his dash speed. However, Ike definitely has his drawbacks. His dash speed is fairly slow, and he is a somewhat tall target. His Counter is quite slow, requiring some prediction to use effectively (it takes approximately six frames longer than Marth's counter compared to Marth's which takes only four frames for the counter frames to start). On the other hand, Ike's counter frames end six frames later than Marth's (both of their counters last for about 59 frames, 23 of them being counter frames), making him less vulnerable afterwards. His throws do low damage. Ike's recovery is also somewhat predictable, because he has a short double jump and only two main recovery moves (Quick Draw and Aether) which have limited trajectories and cannot both be used in the same recovery. Quick Draw needs to be charged to get far, and is easily blocked by anyone willing to get hit by it before Ike can reach the ledge, making him extremely vulnerable to low-angle attacks and edge guarding. Aether is very predictable but also difficult to guard against by any character with short ranged attack, due to the knockback resistance the move grants and the fact that Ike's sword reaches the ledge long before he does. Still, he is vulnerable to edgehogging as it does not grab the ledge until he is descending with the attack and most characters have at least one attack that can knock Ike out of Aether. It is also vulnerable to gimps from moves that push others away (e.g. Mario's F.L.U.D.D. or Squirtle's Water Gun). Also, Ike lacks a projectile, and is himself extremely vulnerable to projectile camping from characters such as Falco and Pikachu. His attacks can generally be avoided/dodged easily because of the massive starting lag on all of his attacks. Additionally, he is one of the easiest character in the game to punish a missed move due to the extreme ending lag on his attacks and extreme unsafeness on his moves when shielded. Because he is a large heavyweight with fast falling speed, he is susceptible to chain grabs and walls of pain. In the end, Ike must rely on careful prediction and spacing of the opponent to even land a single attack, much less win the match, but when effectively doing so, smart Ike players can end or mostly obliterate a stock within a matter of seconds. Still, Ike cannot handle many high-level match-ups, due to his lack of fast aerials and slow speed overall that forces over-reliance on the opponent's mistakes. 4% Ike jabs, kicks, and then executes an overhead slash. One of the strongest neutral attacks in the game along with Snake, being capable of KOing opponents around 150%. 15% (blade), 14% (upper body), 12% (lower body) Ike swings Ragnell horizontally. Has a slow startup but high knockback and good range. Can be angled. 12% (clean), 9% (clean hilt), 10% (late) Ike holds Ragnell out parallel to the ground and raises it to above his head in a bunny hop motion. Deceptive range with a quick, good for low-percent combos, but punishable if it misses. Above average knockback. 14% Swings Ragnell horizontally across the ground. The tip of the sword can meteor smash airborne opponents and launch grounded opponents upwards for followup attacks at low to mid percentages. 8% (tip), 7% (blade) Ike swings Ragnell upward after charging forward. This attack has some delay before coming out, and Ike speeds up once he swings Ragnell. Good surprise move at a distance but is slow and predictable. 22% (early & clean blade), 20% (clean body), 17% (clean tip) Ike performs a very powerful overhead swing. The move starts with Ike slowly heaving Ragnell over his head before striking with a heavy downwards slash, and it is one of the slowest forward smashes in the game, startup and endlag wise. Superior KO move at relatively low percentage, but requires careful timing to use effectively. Long range and high arc allow for edge and recovery interceptions. It also hits characters standing on platforms above Ike and hits diagonally down on characters hanging on the ledge. The power behind the smash is enough to KO an opponent at as low as 30% when fully charged. Second strongest smash in the game (only King Dedede's forward smash is stronger, but Ike's is even stronger at extreme percentages due to slightly higher knockback scaling [the highest in the game]). 13% (hit 1), 16% (hit 2 clean), 8% (hit 2 late) Ike does a stab in front of him, then behind him after a pause. The second hit behind Ike deals more damage and knockback, good for hitting rolling opponents. 9% Ike swings Ragnell in an arc around his body. The attack is shorter ranged than most of his aerials, but covers almost 360°. 13% A powerful, overhead swing downwards. Relatively fast and powerful enough to KO at high percentages, but has some startup, like most of Ike's aerials. 14% Ike quickly swings Ragnell behind him. This is Ike's fastest aerial and performs greatly with RAR, due to its high KO potential. However, the hitbox ends quickly and has long aerial ending lag despite the autocanceling frames coming out noticeably earlier. 14% Ike swings Ragnell in a helicopter motion above his head. The attack stays out for a long time and has good horizontal range, though low vertical range limits its usefulness, considering Ike's inferior jumping capabilities. Has great vertical knockback. 16% (clean), 12% (late) Ike thrusts Ragnell down under him. If the move hits while the blade is swinging down, it will powerfully meteor smash the target downwards. Will send foes upwards rather powerfully if hit after the initial swing. Has noticeable endlag. 3% Headbutts opponent. A slow pummel. 2% (hit 1), 4% (throw) Ike throws opponent forwards while kicking them. Can chain grab in walls. 2% (hit 1), 4% (throw) Ike throws the opponent backwards while kicking them. 2% (hit 1), 4% (throw) Ike throws Ragnell into the ground and uppercuts the target into the air. 2% (hit 1), 4% (throw) Ike throws the target down to the ground and stomps on them, sending them upward. Places low-damaged foes in a perfect position to follow up with an Aether (without DI). This is Ike´s strongest throw knockback wise. 6% Gets up and slash both sides of himself. 6% Gets up while doing a rising spin slash. 5% Does circular swing while getting up. 8% (blade), 6% (hilt & body) Ike leaps up and spins upward with Ragnell. 10% Ike slowly gets up and does a horizontal slash with Ragnell. Eruption 9% (uncharged), 37%/28%/26% (fully charged bottom/middle/top) Ike charges Ragnell before thrusting it in the ground, creating a pillar of red fire. If fully charged, Ike receives 10% recoil damage. The uncharged tip of the blade can meteor smash. High vertical range which increases as the move charges. Good for edgeguarding. Quick Draw 9% (uncharged), 16% (fully charged) Ike charges, and rushes forward upon releasing. If Ike comes into contact with another fighter, he slashes in a similar way to that of the forward tilt. Charge can be held indefinitely. If Ike does not hit, the move has long ending lag. Using the move while airborne causes Ike to become helpless, regardless whether he hits someone or not. Aether 6% (hit 1), 4% (hit 2), 2% (hits 3-6), 3% (descent), 6% (landing) Ike throws Ragnell upward, launching nearby fighters in the air. Ragnell spins in place, dealing several hits. Then, Ike jumps up and grabs Ragnell, followed by a downward slam. Ike has super armor for most of the move's duration. It offers poor horizontal recovery, but good vertical distance. Counter 1.2x damage of countered attacks, 10% minimum Ike holds up Ragnell. If Ike is hit shortly after the move begins, he strikes back. Great Aether 5% (hit 1), 3% (hits 2-8), 2% (hits 9-10), 3% (hit 11-14), 5% (hit 15-16), 12% (hit 17) Ike performs a fiery uppercut with Ragnell. If he catches anyone, Ike throws his blade into the air along with the opponents, jumps after them, catches Ragnell, and unleashes a devastating combo of slashes and kicks before driving them down to the ground. The impact creates a massive explosion which launches the victims and any bystanders towards the upper blast line. Warps onto the stage using warp magic, then slashes Ragnell. Up taunt: Charges up Ragnell as wind blows into his cape, grunting loudly. Down taunt: Wind blows into his cape as he slams Ragnell into the ground and grunts, before removing it. Tap Ragnell on his shoulder. Rubs the edge of Ragnell. Ike says "Prepare yourself." in a different tone than his side taunt. A small orchestral cover from the title theme of the first Fire Emblem game. Up: Forcefully plants his sword into the ground, folds his arms, and says, "You'll get no sympathy from me!" Left: Slashes his sword twice and says, "I fight for my friends!" Right: Performs Aether while facing the screen. Ike initially placed 25th on the first tier list for Brawl, with most noting that his below-average speed with his high raw power made him a solid middle tier character. The changing metagame of Brawl, however, began to favor characters that had either superb camping prowess or the mobility to counter it, which were two things that Ike lacked. As a result, Ike began to consistently fall on the tier list; on the fourth list, Ike had fallen to 29th place, and it was widely assumed that he would eventually fall into the bottom tiers. At this point, Ike was frequently derided as a "noob character" in the competitive Brawl community who relied far too heavily on abusing opponents' errors to KO. The sudden appearance of San, however, caused Ike's perceived viability to immediately reverse. At Apex 2010, a tournament that was known for hosting some of the best smashers at the time, San's 9th place finish with Ike in a pool of over 63 other smashers was an upset to the community, and his continued dominance at low tier tournaments also caused a revitalization of Ike's metagame. San pioneered the use of Ike's surprisingly flexible and powerful jab in his metagame, as well as demonstrating that Ike's aerial and spacing powers were more powerful than previously thought. As a result, Ike jumped four places to the 25th spot on the fifth tier list. He currently ranks at 23rd in the game, higher than any of his previous placings; while he is still unable to consistently win against more powerful characters, Ike is currently seen as a solid mid-tier character, as evidenced by a surprising fifth place finish by Ryo in WHOBO 4, as well as continued strong showings in mid-tier tournaments. Ike's first appearance is at the Battlefield Fortress, helping out fellow Fire Emblem hero, Marth, and his new partner, Meta Knight, by halting the Ancient Minister's escape with his trusted Aether move (though he says Great Aether), which also destroys the Subspace Bomb (making Ike the only character in the Subspace Emissary to successfully disarm a Subspace Bomb). He then teams up with the two swordsmen. Ike's team is later seen in The Wilds, tracking a tank. The three then chase after it, only to find that it is the Subspace robot, Galleom. Galleom is defeated, but jumps off the cliff and into The Ruined Hall, where Lucas and the Pokémon Trainer defeat it once more. Upon its defeat, Galleom grabs the two and attempts suicide with its built in Subspace Bomb. Fortunately, Meta Knight rescues Lucas and Pokémon Trainer, and brings them back to Marth and Ike. Ike is briefly seen at the Glacial Peak level when they see the battle between the Halberd and Great Fox, in which at that point, Meta Knight leaves the party. The Ice Climbers, who have fallen off the mountain, join Ike's group just in time for a large battle with the Subspace Army. Luckily, Mario and Link's team arrive to help out, after which they join up. Ike's next appearance is at the Entrance to Subspace level, where he can be used. Ike is one of the many to be turned into a trophy by Tabuu's Off Waves. His trophy can be picked up at the first Subspace level. Once he has rejoined the team, he is available for use in The Great Maze, as well as in the Tabuu battle. After The Ruined Hall is completed, Ike, Marth, the Pokémon Trainer & Lucas only make cameo appearances until Entrance to Subspace. These stickers can only be used by Ike or by a select few including Ike. Event 9: The Monster Beneath the Earth: Ike must defeat two Diddy Kongs on Castle Siege before stage transitions to the underground cavern. Failing to do so makes the player also face a giant Donkey Kong. Event 39: All-Star Battle x2: Ike is one of the eight opponents fought in this event along with King Dedede, Lucario, R.O.B., Toon Link, Snake, Sonic, and Wolf. Co-Op Event 11: The Great Remodeling Battle: Luigi and Peach must collect 300 coins from Marth and Ike without destroying any of the breakable pillars on Luigi's Mansion. Ike's main and Final Smash trophies can be obtained by clearing Classic Mode and All-Star mode respectively with Ike. The Aether Ike uses to destroy the Subspace Bomb looks like a normal Aether, although he shouts "Great Aether". This is because "Aether" is said with two syllables in Japanese (天空 Ten-kū, literally "Sky"), thus necessitating the changed battle cry. While Ike is an infamously slow character in Brawl, he actually has very good speed stats in all of his Fire Emblem appearances. In addition, while having the highest overall KO power in Brawl, multiple characters in both of his games can have higher strength than him. In his first game, Ike is actually likely to be faster than he is strong throughout the game. This trend continues into the second game, though the endgame of this game can cause him to have roughly equal speed and power. Similarly, while Ragnell is visually a heavy weapon in Brawl that seemingly slows Ike down, and has a weight of 20 (versus a weight of 7 for Ike's older preferred weapon, the Regal Sword) in both Path of Radiance and Radiant Dawn, Ike statistically is more likely to be able to wield Ragnell without any problems than he is to be weighed down by it in the Fire Emblem games. Ike's on-screen appearance is shown as Warp Magic or Warp Powder from the Fire Emblem series. However, neither of the two games he appeared in allowed him to use warp magic in any capacity; a variety of items that could be used to warp were only ever seen used by opposing armies and characters. Ike's appearance in Brawl is based on his default class appearance and official art in Path of Radiance; however, the aforementioned class, the Ranger, is unable to wield Ragnell in any capacity. Ike's second class, the Lord, allows him to wield Ragnell, but this class features him wearing different clothing than that found in Brawl. Ike's "We Like Ike" chant is a reference to the "I like Ike" slogan of the "Draft Eisenhower" campaign that led Dwight Eisenhower to become President of the United States. On custom stages, Ike's sword trail animations on his aerial attacks will only play if done at the peak or near the peak of his jump and midair jump; when attacking after or before the peak of a jump Ike's sword will simply glow and leave no trail, except his up aerial. This also happens to Marth. There is a glitch relating to Ike on Corneria. On the far left of the back fin on the Great Fox, he must grab King Dedede. He will rotate infinitely between his aerial and grounded grab animations. Ike is the first playable Fire Emblem character in the Super Smash Bros. series to speak English. Additionally, he is the first Fire Emblem character available as a starter character in the Super Smash Bros. series, as Marth and Roy were previous unlockables. 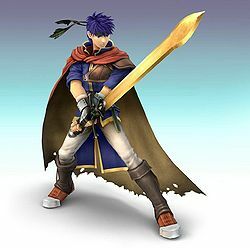 It was a common theory that Ike "replaced" Roy from Super Smash Bros. Melee, due to them having a similar neutral special and both being sword wielders. However, leftover data on Brawl's disc shows that both Ike and Roy were planned to be playable in Brawl. A similar theory existed for Lucario and Mewtwo. This page was last edited on April 14, 2019, at 21:27.